Welcome to the Canon connection guide! The process of connecting Cascable Transfer to your camera is usually very simple. This guide will walk you through the steps. If your camera has separate options for connecting to a desktop computer or a smartphone, choose whichever one is best for you – Cascable Transfer supports either. Enable your camera’s WiFi connection as you’d like to use it – follow the instructions in your camera’s user guide. Your camera will instruct you to launch the app to connect to it. On your Mac, use the click the Wi-Fi indicator in the menu bar and ensure that your Mac is connected to the same network as your camera, then launch Cascable Transfer. Cascable Transfer should find your camera after a few moments and start connecting to it. To continue, look at your camera’s screen and follow the instructions. Canon cameras will ask you to confirm which images are available to the connecting app. 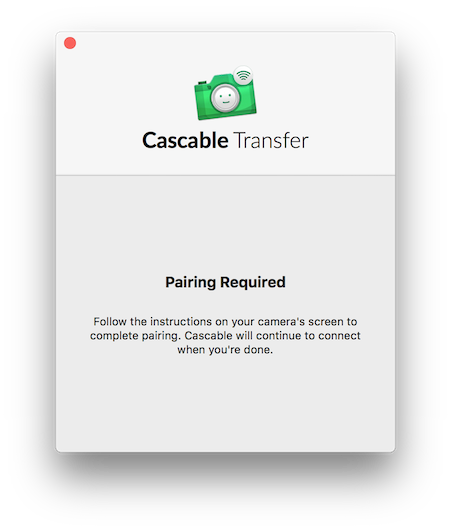 Once you’ve made your choice, Cascable Transfer will dismiss the dialog and continue connecting. After your camera has been set up and paired, subsequent connections are much simpler! First, turn on your camera and switch on WiFi. Depending on your camera model, you can have WiFi turn on automatically with the camera if you wish. Ensure your Mac is connected to the same WiFi network as your camera, then launch Cascable Transfer. Cascable Transfer should find your camera afer a few moments and connect to it.